Leicester City got Matchday 25 of the English Premier League off to a rip-roaring start thanks to a shocking 3-1 win at Manchester City in which defender Robert Huth, of all people, scored twice (Riyad Mahrez did too). Elsewhere, Liverpool gave up a two-goal lead after its own fans walked out in protest of ticket prices, and Everton got its first win in five league games vs. Stoke. LONDON (AP) — Tottenham climbed to second in the Premier League for the first time this season with a 1-0 victory over Watford on Saturday, taking advantage of Manchester City's slip-up. Kieran Trippier's first goal for Tottenham took the north London club ahead of City by a point. Tottenham is five points behind leader Leicester, which eased to a 3-1 victory over City earlier in the day. Spurs controlled the game at White Hart Lane without providing a sustained goal threat. The breakthrough came in the 64th minute when Dele Alli crossed across the face of goal for Trippier to tap in at the far post past former Tottenham goalkeeper Heurelho Gomes. The defender, playing his first season for Spurs, last scored for Burnley more than two years ago. LIVERPOOL, England (AP) — Relegation-threatened Sunderland came from two goals down to draw 2-2 with Liverpool in the Premier League on Saturday with manager Juergen Klopp missing and many home fans having left before the visitors rescued a point. Klopp was absent from the Anfield dugout with a suspected bout of appendicitis, and first-team duties were left to his two trusted assistants, Zeljko Buvac and Peter Krawietz. Neither of them, both with Klopp at Borussia Dortmund, could have envisaged a draw with 10 minutes remaining as the home side had established a 2-0 lead. Nor could the many supporters seen leaving in the 77th minute, with that two-goal advantage still intact, as they staged a protest against rising ticket prices. Liverpool looked set for victory after Roberto Firmino scored one and created another in a lively second half following a forgetful first. The first period will best be remembered for the loss of defender Dejan Lovren and midfielder Joe Allen, although Daniel Sturridge's name on the substitute bench for the first time in two months, will be the one positive on an otherwise sour day. James Milner crossed for Firmino to head past Sunderland goalkeeper Vito Mannone in the 59th before the Brazilian international set up Adam Lallana for the second in the 70th. The 24-year-old Firmino robbed Billy Jones in possession before racing toward goal and squaring for Lallana to tap in. From that point, a home victory looked certain but goalkeeper Simon Mignolet allowed Adam Johnson's free kick in the 82nd to creep in at his near post. The Belgian goalkeeper was left ruing that error when striker Jermain Defoe lashed in the equalizer with two minutes remaining. Wahbi Khazri, making his first start for Sunderland since joining from French side Bordeaux in January, found Defoe on the edge of the area and he expertly held off defender Mamadou Sakho before turning and firing past Mignolet. What does transfer splash do for China's aspirations on global scale? "You think your day is over when you are 0-2 down at Anfield. 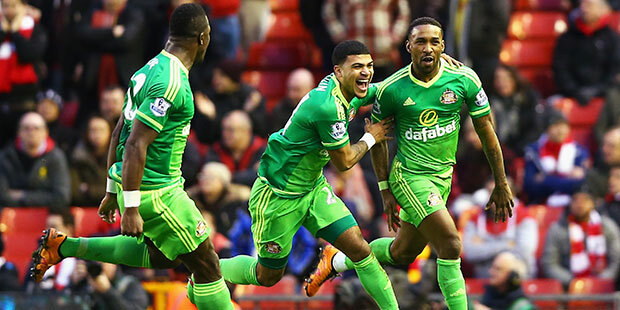 But we fought back with two quality goals and got a point by not giving up," Sunderland boss Sam Allardyce said. "It was 'never say die' until the end. When we went two down it looked like the fear had left us and we played better with the ball". That point leaves Sunderland second from bottom with 20 points, four adrift of regional rival Newcastle, which moved out of the bottom three following a 1-0 win over West Brom also Saturday. Liverpool has 35 points, level with Everton following the Toffees' impressive 3-0 win at Stoke. TOKE, England (AP) — Everton ended a run of five English Premier League matches without a win in emphatic style by downing host Stoke 3-0 on Saturday. The Toffees scored all three before the interval courtesy of Romelu Lukaku, Seamus Coleman, and Aaron Lennon. Lukaku opened the scoring from the penalty spot after Stoke goalkeeper Jack Butland brought down Tom Cleverley inside the area. Cleverley was also involved in the second, with his corner being headed home by Coleman. Stoke gifted the visitors a third when defender Philipp Wollscheid's ball across the field was intercepted by Lennon, who raced toward goal before calmly slotting beyond Butland. 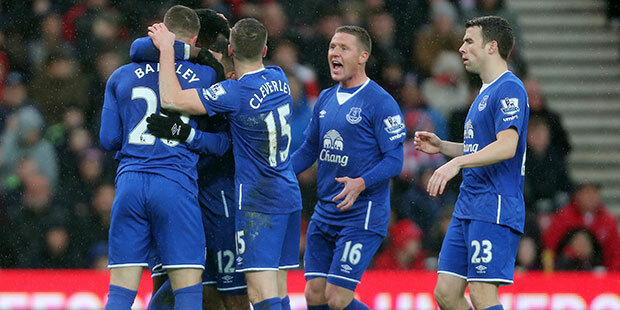 The win moved Everton up to seventh, two points ahead of Stoke in 11th. BIRMINGHAM, England (AP) — Last-place Aston Villa looked determined to take Norwich down to the second-tier, beating the visiting Canaries 2-0 Saturday for its third Premier League win of the season. 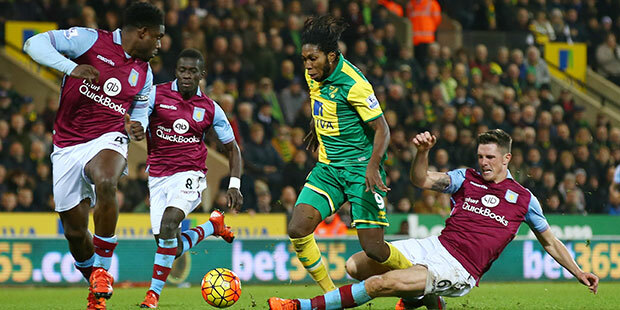 Despite that win, Villa is still eight points from safety but the defeat has seen Norwich dropped into the relegation zone after its fifth straight league loss, including a 5-4 defeat to Liverpool. Joleon Lescott scored just before the interval and Gabby Agbonlahor grabbed his first goal for 11 months. Dieumerci Mbokani brought down Micah Richards on the right in the 45th and Lescott met Carles Gil's free kick at the far post with his header going in off Timm Klose. Agbonlahor doubled the lead six minutes after the break, beating the Norwich offside trap and - with Declan Rudd rushing from goal - slid in from the edge of the box. NEWCASTLE, England (AP) — Newcastle moved out of the Premier League relegation zone with a 1-0 win over West Bromwich Albion on Saturday, swapping places with Norwich. Aleksandar Mitrovic scored the only goal in the 32nd minute at St. James' Park. Jonjo Shelvey split the visitors' defense with a perfectly-weighted pass for the Serbian international to beat the advancing Ben Foster. Mitrovic's fifth goal of the season came only three minutes after Cheick Tiote saw a spectacular effort ruled out for offside. With 13 matches remaining, Newcastle is 17th with 24 points — one more than Norwich, which lost 2-0 at last-place Aston Villa. West Brom has 29 points but is without a win in five league matches. 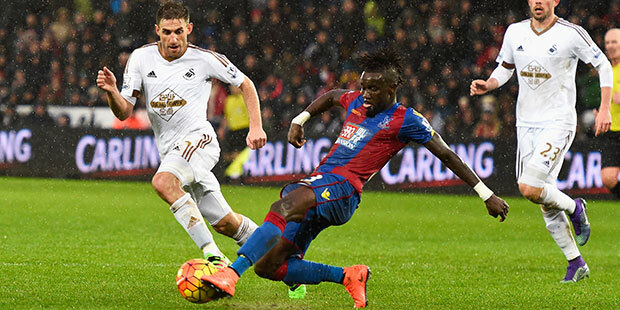 SWANSEA, Wales (AP) — Crystal Palace ended a run of five straight defeats and Swansea bagged a valuable point in its desperation to stay out of the relegation zone following their 1-1 draw in the English Premier League on Saturday. Gylfi Sigurdsson's free kick for his fifth goal in six games earned Swansea an early lead, but it was matched just after halftime by Palace defender Scott Dann. Yohan Cabaye's corner was flicked on by Damien Delaney, and Dann was at the far post to bundle it in. Swansea's second straight draw put it five points above the drop, while Palace, which hasn't won since Dec. 19, remained in mid-table.